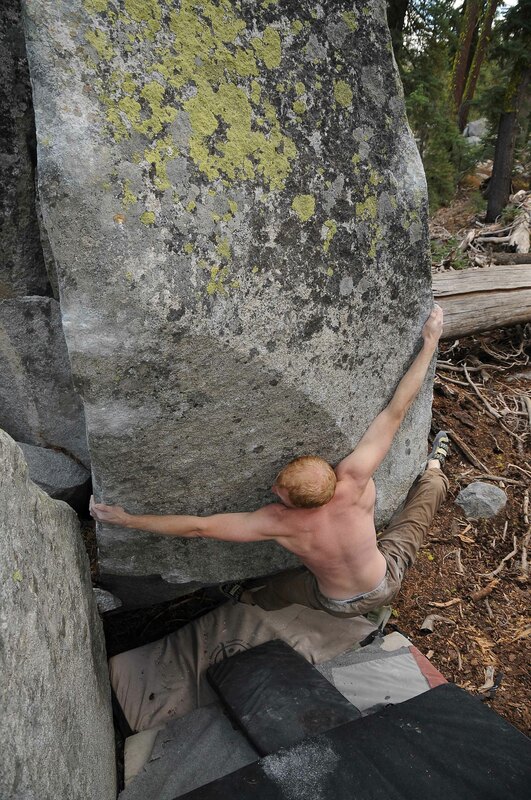 Jon Thompson on “Daddy Plays a Squeezebox” v10 at Sugar Pine 6. September saw slightly better temps and another visit from strongman Jason Kehl. Jon and I took Jason to one of our favorite spots, Sugar Pine 6. After sending some standard classics like “Shedding the Light” v5 Jason made quick work of “Yodenhiem” v9. Then we took him to a few lines we just put up and he did the 2nd ascent on Jon’s rad compression line “Daddy Plays a Squeezebox” v10. We cooled down with a lap on the 4 star classic “Warped into Perfection” v6/7 then did then long, but enjoyable hike out. On Jason’s last day we went to the PCT boulders in hopes of getting the 2nd on Steve Francis’s “Pocket Problem.” Niether Jon or Jason could do the exit moves, even in isolation and this rig remains unreapeted and wicked hard. Likely at least V11/12. With 1 hour of light left Jason got stoked on a different and new (we think) finish to “The Sloper Problem” v5. You start like normal, but instead of rolling left after the first move you continue up right out the steep prow/arête toward the tree and you end up with a much more classic and harder line. We are thinking v7 and Jason named it “Final Hour” in honor of his last fun send of the trip. Jon, Lamberto and I repeated the line a few days later and really enjoyed it, its one of the best lines up there, no joke! Dustin Sabo hit it up a just after and agreed on the rating and quality. Sugar Pine 6 saw a solid amount of development during September. 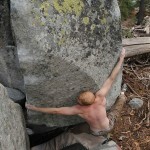 Seth Carter, Jon Thompson, Chris Guiterrez and I concentrated on a new strand of boulders just west of the main circuit. As we worked our way through the new boulderfield it yielded many fun lines in the vo-v6 range before stumbling upon a few really classic gems. “Warped into Perfection” v6/7 climbs a unique steep prow on perfectly sculpted holds. “Daddy Plays a Squeeze Box” v10 is a powerful compression line up a triangle shaped block. At The end of the month visiting climbers Rick Sharf and Kevin Daniels joined me and we cleaned up a huge, gently overhanging block I have be eyeballing for years. The main face was littered with good edges and it provided lines up to v4, all with super fun moves. Over the summer I periodicly went to Christmas Valley to double check the info. Most of the topos were solid except for some silly sit starts I found most unenjoyable, these climbs were much better from the stand. Also, I did spend some time tuning up route desciptions, the overview map and a few other things. Since the NW guide came out, Castle Peak, Summit Lake and Lost in Space have become very popular and it’s almost crowded on weekends somtimes, almost. Still a far cry from Bishop. Oddly, Sugar Pine still sees very few visitors. So if your looking for some solitude it’s not hard to find. I don’t know if it’s the slightly longer approach at the lower areas or the fact that you need 4wd drive at the upper zones, but all is quiet still. Personally I dont think either approach is hard. If you have a bike to ride in and out of Sugar Pine 1 and 2 is actually really fun. And the drive to the upper areas on the Mckinney Rubicon is not bad in a truck, especially consideriing the rewards.